When do you anticipate this being available? You can actually make your own. 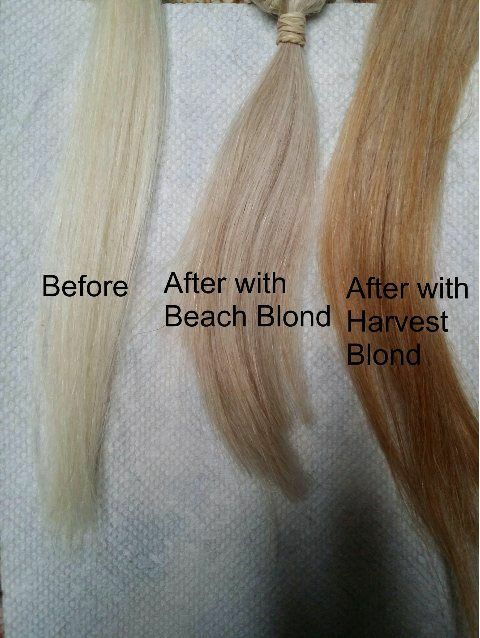 What is the difference in the formulation of Beach Blonde and Harvest Blonde? Are they both a ratio of 3 parts Amla to 1 part Henna or are they slightly different in the percentage of henna? Thankyou. I can’t wait until you have the Beach Blonde available as it is the perfect shade for me. Thanks. Beach blond is = 3 parts amla and 1 part henna. Harvest blond is 3 parts amla 2 parts henna. Can you please let me know when these are available! Just curious if I could mix 3 parts Amla with 1 part Light Brown Henna (as that is what I have on hand) and get a similar result? Yes it will be for light haired people. On dark hair it will not be visible. When using the beach blond mix, do you have to be careful when reapplying on the new-growth roots? Will overlap of this henna mix create a second (darker) color? If your hair is light it will not make to much of a difference. However it can get darker so it is best to do the roots as needed. Then as it fades do the entire head again. I ordered the alma and am hoping to get a bit more information about the process before test strands (as they will still be attached to my head). About how long did you leave this henna/alma mix in? Was there significant oxidation over a couple of days? What tone (pinker, darker, redder, browner?) did it turn, if it turned at all? Thank you! All of our dyes are 1 hour. But makes sure you mix in the henna accordingly. 3 parts amla and 1 part henna will make a light blond. My hair color doesn’t seem to fall under any color. I have been golden mixed blonde all my life, until out of sun last 10 years. Now i am ash blonde/ brown. No chestnut . Closest I can see is the color harvest blonde. What color or colors should I be using? I want to highlight my blonder tones. Can you give me a recipe, directions of how to proceed? What color are you trying to highlight? Our dyes will not go lighter only darker. If you already have high lights they will be lighter than the color of the other hairs. P.S. I much prefer premixed hair color. So if I need to mix colors, ammia ,etc. amounts (not just parts1:3′ whatever) would be helpful. I have long, thick just below shoulders length hair. We pioneered pre-mixed colors. But for the blond it is the only way at the moment. 3 to 1 is easy and everyone has a different length. So in your case 3/4 cup amla and 1/4 cup henna. More info: I’m really trying to figure out my hair color in words, as I haven’t come up with anything clear before. Saw picture in category “Before”. As you scroll down, there is a woman with very long wavy hair showing her back. 1 side appears more blonde (right) and left appears more brown. I am more the left side color with the right side mixed in. Hope this helps. Plus I will do some lightening techniques before I actually do henna dye. I need to know her name, then I can give you more advice. So here’s my questions: what are the color options for ash tones-Brown/Blonde. Former natural blonde. Never have used hair dye. No gray or white. Do not want to go darker. Please respond. Blond only works on people with white or gray hair. It will not make your hair lighter. However lightening your hair is extremely difficult on some people. Some almost impossible. Still curious when this product will be available I am a natural blond, I am very interested in the beach blond as well. Will it condition my hair or just color it? It will do both. You can purchase our amla and henna and mix your own. It is going to be a while until the final package comes out. Stunning color, and brilliant shine, too! This is a very natural looking blonde, and it is beautiful. I’ll have to look this up and see if maybe I want to try it out for myself. Thanks for sharing! I have a natural dirty dishwater slightly ashy blonde with some sparkly golden strands. Would either of theses mixtures do anything to my color? 10 years ago my hair was such a beautiful blonde and I don’t ever want to use chemicals again. I will stick to my ugly color before I ever dye it with the chemical filled box crap again. My hair has been thinning and falling out. It is also very brittle. Parts of my scalp are extremely dry and other parts ridiculously oily. The very tips of my hair are the only healthy part and they were dyed with your (natural red) henna 2 years ago. That was the last time I colored it but I don’t want to be red again or this icky color I have now if there is a solution. This will work as long as your hair is light in color. We are getting great results. Good for you not using chemicals! It is good for a women to shed hair and is very natural. You should see hair in the shower each time you shampoo. They will not cover the pepper part. few question about the beach blonde. Will it still shine red in the sun, do you dye release the henna, and what will it dye darker hair. Will you get a red tint? You should not get a red tint. But keep in mind you have to bleached blond to start or have white hair. I would like to order your harvest blond hair and beard product.how do I go about doing this. It is not available yet. It should be in this month. Is the harvest blond available yet? Not yet, we are working diligently on it though. How do I order a sample of your new Harvest Blond? Sorry it is not available yet. It will be before the end of the year. So sorry Andy, FDA regulations take a while 🙁 🙁 It should be prior to the end of the year. Will Amla be available soon? It will be by the end of the year. I have been using the light brown for years and have a couple packages of that left. Is it possible to mix that with the Amla 3:1 to get an ashier beach blonde? Or would you not recommend that? It will certainly make it more of an ash color and lighter. How can I buy Natural blonde? We are trying to get it here as fast as we can. Sorry. We were hoping before the end of the year. With the Harvest Blonde color – will the amla eventually wash out like indigo would, and leave just the red from the henna behind? I have done the strawberry blonde many times, but don’t want to go red again. That was too orange on me. It all depends on your hair. While testing it it was very permanent. There is so little red in it it should not make a matter of a difference. We are waiting on new labels to be printed. The FDA gave us some grief about bringing it in. So please check back should be very soon! I tried the LIGHT BROWN henna, mixing it with warm water, to a yogurt like consistency. Applied to my hair and put a shower cap on for 1 hour. When I rinsed my hair out, it was a carrot orange. I’ve tried adding Amla to the Light Brown henna, but it just lightened the orange. Should I add a little Indigo henna to get rid of the orange? I really want a light brown. Orange when you rinse is OK, it will darken up over night, make sure you give it enough time. I am working on a ash blond. Amla was good choice, however it can/should be mixed with it from the beginning. Check your Facebook page. You’ve upset many really good customers. I think you owe everyone a helluva an apology. No emails answered, no phone messages answered. Great product but lousy way to run a business. Hi Johnny, she should be in jail is what she should be and an apology. My name is Rod Harper, the original founder. I got hennahut.com back and she made a hell of a mess. Not only did she take me for hundreds of thousands and leave me homeless, she took advantage of the customers. You can read about it here: https://www.hennahut.com/press_release, for 2.5 years I fought to get it back. I finally won. Ive been through hell and back, but I am so glad to be back. Can I make my hair blond with henna? like first photo above! I have light-nrown now but I have always dremt to be blonde.